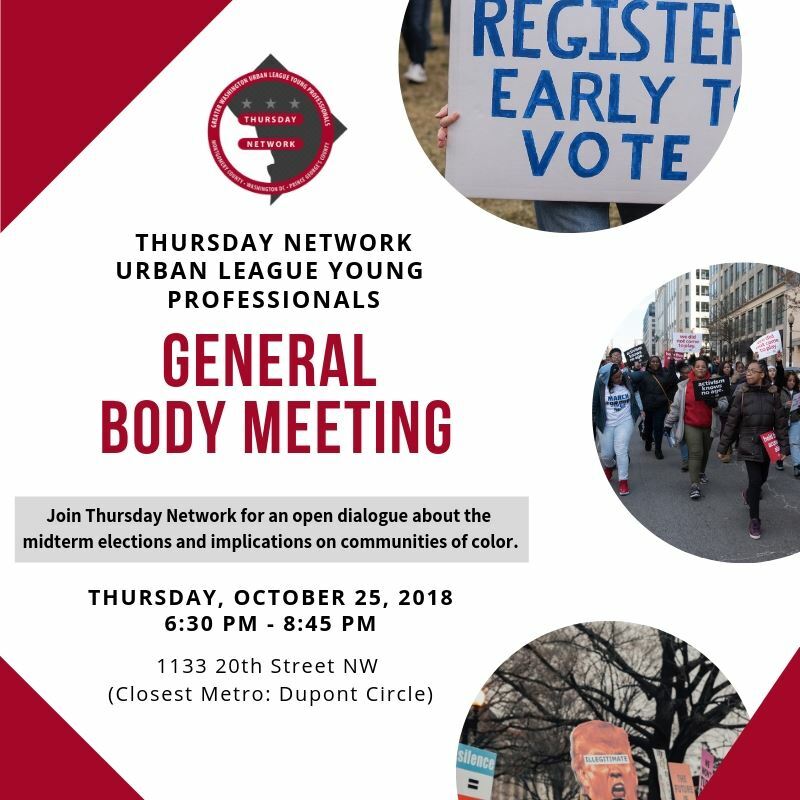 Join Thursday Network for our monthly General Body Meeting and a bipartisan panel of experts to discuss the midterm elections and implications on communities of color. Andrea Cambron began her radio career in Decatur, Il. when a friend suggested she host a college radio show for fun. It was one of the best pieces of professional advice she has taken and hasn’t looked back since. After transferring and graduating from Howard University with a BS in Radio/TV/Film, Andrea worked at various stations in the Washington, DC area including WHUR, WERA, Radio One and (Sirius) XM Radio as an on-air host, reporter and producer. As a producer, Andrea covered everything from Occupy Wall Street to the White House. But it was her work hosting a segment on women’s issues on Sirius XM that fueled her passion to dissect federal policy as it relates to equality, civil rights and our national health system. Now that she’s back to her roots as a reporter covering the DC market for WTOP, she is excited to work with some of the same colleagues she started her career with almost 15 years ago. In her spare time, Andrea is the Executive Producer and Host of the podcast Enlighten Me, available on ITunes, Spotify and all other podcast platforms. There’s also a good bet that you can catch her at any number of events the ladies of the Xi Omega chapter of Alpha Kappa Alpha organize, or you might see her at any of the local parks or museums with her children. Andrea is married to Chinelo Cambron and they have two children, Sasshem and Aqmeri. Donald R. "Don" Cravins Jr. is a Democratic politician from the U.S. state of Louisiana. Cravins first sought elected office in 2004. On November 2, 2004, he was elected state representative for District 40 in a runoff election where he received 54% of the vote. When he was elected, he and his father, then state Senator Don Cravins, Sr., made Louisiana history by becoming the first father and son duo to serve in the Louisiana Legislature at the same time. In 2006, Cravins' father resigned from the Louisiana State Senate to become Mayor of Opelousas. Cravins Jr. ran unopposed to fill the unexpired term. In the October 20, 2007 election, Don Cravins Jr. was re-elected to the Louisiana State Senate and garnered 74 percent of the vote. He represented Senate District 24 from December 2006 until January 2009. In 2006, Cravins was selected to serve as King Toussaint L'Ouverture, XLVIII by the Lafayette Mardi Gras Festival, Inc. in Lafayette, Louisiana. In the 2008 congressional elections, Cravins unsuccessfully ran as the Democratic candidate for Louisiana's 7th congressional district seat held by Republican U.S. Representative Charles Boustany Jr. In addition to Boustany, Cravins faced Constitution Party candidate Peter Vidrine. Boustany won the match. In a letter dated January 4, 2009, Cravins announced his resignation as state senator to take a position as Staff Director and Chief Counsel of the U.S. Senate Committee on Small Business and Entrepreneurship. Cravins also served as chief of staff to United States Senator Mary Landrieu, a Democrat from New Orleans from 2013 to 2015. In 2015, Cravins was named the Deputy National Political Director for The American-Israel Public Affairs Committee. On July 7, 2015, he was named the National Urban League’s Senior Vice President for Policy and Executive Director of National Urban League Washington Bureau. As such, he is responsible for the Urban League Policy Institute, with primary responsibility for developing the League’s policy, research and advocacy agenda and expanding its impact and influence inside the beltway. He will also be devoted to the League’s mission to empower communities through education and economic development. In addition to his employment at the National Urban League, Cravins is an adjunct professor at The George Washington University. Cravins also serves as a Judge Advocate in the Washington DC Army National Guard. Shermichael Singleton is a writer, political consultant, and former CNN Political Commentator who now appears regularly on MSNBC. He’s worked on three presidential campaigns, starting with former Speaker of the House Newt Gingrich during his time as a student at Morehouse College in Atlanta, Georgia. During that time, he worked to mobilize college students on behalf of the Gingrich campaign and assisted in developing the youth outreach and mobilization strategy. He went on to work for former Massachusetts Governor Mitt Romney who became the Republican nominee. During his time on the Romney/Ryan campaign, he worked with Will Ritter, one of Governor Romney’s longtime aides in the department of advance and operations, where his role also expanded to working with various coalition groups during campaign stops. After his work on the Romney campaign, Shermichael traveled back home to Texas where he ran his first campaign. As campaign manager, Shermichael guided an unknown candidate to victory, successfully defeating a 15-year incumbent. His work in politics took him back to Georgia where he was involved in various local races. His work then took him to Aventura, Florida where he served as a consultant for Lauren’s Kids, a non-profit that focuses on raising awareness about child sexual abuse. After his stint with Lauren’s Kid’s where he was a part of a team that planned a statewide awareness campaign throughout Florida, he joined America Rising, LLC. At American Rising, he was a field opposition researcher, where he was a part of a team that created the first Republican national opposition database targeting Democratic candidates. His focus state was Virginia where he provided opposition research to the Ed Gillespie Senate Campaign. He also provided opposition research for two contested Republican congressional campaigns. After the election of Donald Trump, Shermichael was appointed as Dr. Carson’s top aide during the presidential transition process. He played a pivotal role in successfully guiding Dr. Carson through the Senate confirmation process including co-writing Dr. Carson’s Senate hearing opening statement. Soon after, Shermichael was appointed to the Department of Housing and Urban Development (HUD), where he was sworn in as the Deputy Chief of Staff, the youngest ever appointed to the role in the history of the agency. Getting acclimated to his role at HUD, Shermichael was later fired by the Trump Administration after an articled surfaced where Shermichael criticized then-candidate Trump. After losing his position at HUD, Shermichael joined CNN as a Political Commentator. After a year with CNN, Shermichael began providing political analysis on MSNBC. Outside of his TV commentary, he writes for The Hill and has also written for The Washington Post and CNBC online. He has been featured on panels at various colleges and universities across the United States including Harvard’s John F. Kennedy School of Government. A native of New Orleans, Louisiana, Singleton studied Political Science at Morehouse College and Government and Politics at the University of Massachusetts Amherst and is a graduate of Southern New Hampshire University. Nisha Jain is a Vice President at GBA Strategies with over a decade of experience in conducting quantitative and qualitative research for Democratic candidates, progressive causes, Fortune 500 companies, and trade associations. She lends her expertise in public opinion research to develop winning messaging and strategies for political and advocacy campaigns. Prior to joining GBA, Nisha served as a Senior Director at Purple Strategies. As part of the Insights team, she led design, execution, and analysis for US and global research engagements for companies undergoing crisis or looking to bolster their brand reputation. Prior to joining Purple, Nisha was Research Director at Momentum Analysis, where she led quantitative and opposition research for Democratic campaigns ensuring clients had a roadmap for getting the right messages to the right voters. Nisha also serves on the board of directors of the Washington Leadership Program, a national non-profit organization developing the next generation of South Asian American leaders. Nisha is a graduate of George Mason University where she studied Mathematics.